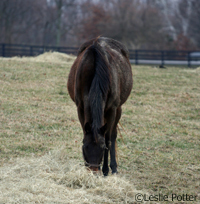 Kentucky is the heart of Thoroughbred racing in the United States, and the Kentucky Equine Humane Center (KyEHC), located in Lexington, Ky., takes in many horses from the states’ tracks. The Center has a stall at each racetrack to house horses until they can be transported to the KyEHC facility. “If people can’t keep their racehorses or don’t want them anymore, we have surrender stalls where they can drop [a horse] off, and our paperwork is in the racing secretary’s office,” explains director Lori Neagle. KyEHC volunteers at the tracks care for the horses until they can be moved. Ex-racehorses are often featured as KyEHC Horses of the Week, including Magnify, Lotawana, and Gator. Read more about how retired Thoroughbred racehorses are receiving financial help with the Checkoff Program and the Pony Up Program.